If your house has drafty windows, your heating and cooling systems may be working harder than they need to. Taking a little time to identify and plug up leaky windows will help you keep your home’s temperature—and your utility costs—in a comfortable range. If you suspect that a window is leaky, first make sure the hardware is locked so that sashes are snug. If you still feel a draft coming from a locked window, you can do a little detective work to find the source of the leak. 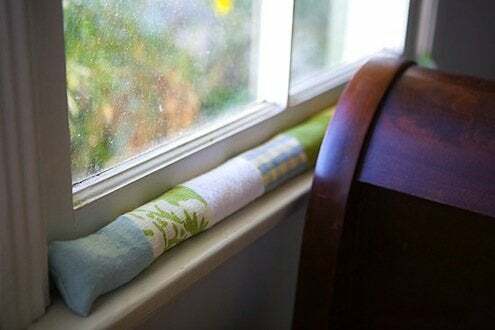 First get any curtains safely out of the way, then hold a lighted candle or a piece of tissue along the window’s seams. If the flame bends horizontally, or if the tissue flutters, you’ve found a leaky spot. Check the weatherstripping near the leak and replace it if it’s worn or damaged. Also, check the caulk. If it’s cracked or loose, remove it from the drafty area, thoroughly clean out any dirt or debris, then re-caulk. If these quick fixes don’t stop the drafts, and if new windows aren’t in your budget, consider purchasing a window-insulating kit, which allows you to temporarily “shrink-wrap” plastic film to the inside of your window using a hairdryer. There are also decorative remedies, such as installing insulated shades or curtains.